We endorse Jumaane for Public Advocate! An important special election will be held on Tuesday, Feb. 26 for NYC Public Advocate. NYC Kids PAC reached out to all the candidates to fill out our survey, which asked about their positions and records on the most important issues of the day affecting our schools. We received completed surveys from seven of the front-runners, and we urge you to take a look. 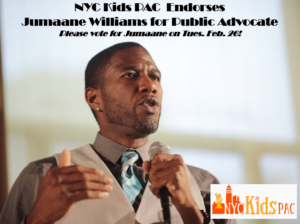 Though nearly every candidate responded with thoughtful comments, we decided to endorse Jumaane Williams for the office of Public Advocate – not just for his impressive answers but also for his progressive record on education as a member of the City Council. We also want to highlight the excellent responses of Nomiki Konst, and we hope she runs for office again at the local level. But we believe that Jumaane has earned our endorsement, and we urge you to volunteer or donate to his campaign.